In continuation of this Directorate’s Office Memorandum of even no. dated 26.12.2017 regarding empanelment under continuous empanelment scheme, the undersigned is to convey that in addition to the list of the hospitals (including dental clinics & eye centres) and diagnostic laboratories already empanelled, the hospitals (including dental & eye centres) and diagnostic laboratories as per the list attached (22 HCOs) have also been empanelled under CGHS in Delhi & NCR with issuance of this order. 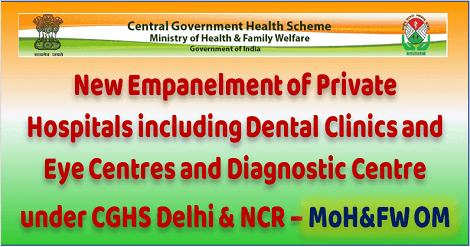 The newly empanelled hospitals (including dental clinics & eye centres) and diagnostic laboratories may be treated as included in the existing list of empanelled health care organization under CGHS on same terms and conditions as have been indicated in the Office Memorandum dated 26.12.2017. 2. East Delhi, Medical Centre, 1-550, G.T. Road, Mansarovar Park, Delhi – 110032. Tel. No. 011-22583204, 22596736 QCI Recommended General Medicine, Gynae & Obs., Orthopedics and joint replacements, General Surgery, Medical & Surgical Oncology, Neurology & Neuro Surgery, Nephrology, Gastroenterology, Eye and Diagnostics. 3. Rosewood Hospital (A unit of JLKD Healthcare Pvt. Ltd. 5, JL Block, Roshan Garden, Najafgarh, New Delhi – 110043. Tel. No. 011-25322537, QCI Recommended General Medicine, Gynae & Obs., Orthopedics and joint replacements, General Surgery, Neurology & Neuro Surgery, Gastroenterology, Dental, Eye, ENT and Diagnostics. 4. New Balaji Hospital Plot – 734, Haldauni More, Main Dadri Road, Greater Noida-201306. Tel. No. 8285124442. QCI Recommended General Medicine, Gynae & Obs., Orthopedics and joint resplacements, General Surgery, ENT, Eye and Diagnostics.